I had a love/hate relationship with my bicycle last week. I still loved my bike, but I think she had enough of me after I biked 250km last weekend to/from Woodstock. It wasn’t the distance that bothered her, it was the rain. The light rain, we could deal with, but the torrential downpour, is what she was complaining about. When I arrived to greet her Monday morning, a bit earlier than usual to take her down to get cleaned before heading to work, her back tire was flat. I can do this, I thought to myself. So I removed the tire, replaced the tube and put the tire back on. It took me a good 30-45 minutes, but I was still pleased with myself. My first time changing a tire solo! Then I pumped up the tire. I almost had it at 120 psi. I know it can be difficult to pump it up that high, so I almost left it at 90. Nah, I’ll give it a good push or two, I can do it! So I pumped, and pumped… and then FOOSH!! My inner tube exploded and popped off my tire! Without any extra inner tubes, I had to hightail it to work by subway instead. Emails flew between my family and friends. I obviously squished my tube between the rim and tire, they told me. I figured that could be the culprit because I didn’t really check to make sure it wasn’t squished. Next time, I’ll know. But my woes, don’t end there. I felt pretty silly having only 1 spare inner tube, so I wandered over to Bikechain, the student-run group at the University of Toronto that teaches you how to fix your own bike – and also sells cheap inner tubes. There was only one staff at the time, and I was sans bike, so I quickly picked up 5 inner tubes and brought them home. Only to discover, yes, I bought the right size but my valve was wrong! I had just bought 5 inner tubes with the Schrader valve, but I needed the Presta valve! So I lugged out my old bike (I have no clue how I lasted 7 months with a daily commute on that heavy clunker! ), and rode to the closest bicycle shop. To clear them out of inner tubes. I only bought 2. And they were over $1 more expensive than those from Bikechain, and the exact same inner tube. Armed with the proper inner tube, I decided to replace my inner tube yet again. It didn’t take me nearly as long; I must be improving, I thought. Next, I checked to make sure I had no squished tire. I didn’t. Great! And then I pumped up the tire. And pumped, and pumped, and got it up to 120 psi! Woohoo! I removed the pump and took a sigh of relief. Not an instant later, the tube explodes AGAIN! Now I am positively in tears, and know I need someone to help me figure this out. Thankfully, Rob was coming over. I told him it was do or die because I only had one tube left. He supervised me and showed me a different way to assemble the inner tube and tire. I was putting the inner tube on first, then the tire. He assembled the inner tube inside the tire first, and then mounted the whole thing on the rim. Sounded good to me. So we pumped, and pumped, and pumped. 120 PSI! No blow-out! We pumped my front tire to 120 psi. I was good to go! I just need to get more tubes since my back-up tubes are down to zero, but no rush.. The next morning I ride to work. Perfect! It was just technique that was the problem. I return to my bike after work, drive it no more than 6 feet, when I feel like my breaks are rubbing my tire. I look down and I have a flat! No way! Not again! And I have no spare tube.. gah! I take the subway home, grab 2 new tubes from another bike store. Another $2 more per tube. I ask whether some inner tubes are more prone to leaking. I only biked 5 km before I got a new flat, I explained. He suggested that perhaps I had something stuck inside my tire that I couldn’t see. I should clean the inside really well. Excellent suggestion, I thought, and planned to do that next. Before I went to bed, I cleaned the inside of my tire, feeling nothing, but thinking it was something small I couldn’t see. I made sure my inner tube didn’t touch the floor and mistakenly pick up rocks, etc. I replaced the inner tube, with the new Rob-style technique. I pumped it up. And no explosions! Woohoo! Two days go by… I bike to/from work. I rack up 20km. No problem. Those invisible rocks sure were problematic. Or maybe it was the even more expensive inner tube that did the trick. Who knows. I was doing a little cheer every time my bike still had a tire full of air. Friday morning, my bike greets me with yet another flat tire. I am almost not surprised. What am I doing wrong? I notice that there’s an actual direction for my tire. Maybe I had it backwards and that was the problem? I don’t know.. this is all voodoo. I replace my tire again. I figured out where my leak was. Reasonably close to my valve. Maybe it was the metal hooks I was using to help reassemble my inner tube. Apparently that’s a no-no known to cause small leaks if you squish the inner tube. OK, I will look for my plastic ones. I clean it, I replace it, I pump it up. It doesn’t explode. I ride to work. Now I am paranoid. I have no explanations for these flat tires. So far so good, though. I make it to work intact. I meet Rob after work to cycle to a friend’s house. I tell him about my flat tire woes and about my paranoia. How far will I get this time? The first time was 5km. Then 20km. Now what? He looks down at my tire nonchalantly. What’s this?, he says, pointing to a small matte area on my tire. It was less than 1 mm. I have no clue but it looked like a small rock attached to the tire. I try to flick it off but it is wedged in nicely. I use my key to dislodge it and out we pull a big piece of glass! My culprit! My front tire had a smaller piece wedged in as well. After successfully cycling 100km the following day, I knew I was in the clear. 1) Ride your bike with a spare tube (with the proper valve), pump and plastic hooks to change a spare tire. Try to repump your tire to see if it is a slow leak. 3) Remove the inner tube, including any valvular attachment to the rim. If you can figure out where the hole is, great! You might be able to patch it too. Soapy water helps but I also tried to squish out any air all along the inner tube. 4) Try to figure out WHY you got the flat tire. Check the outside, inside of the tire and rim. Sometimes you won’t see anything if it is from having low tire pressure that gets squished over a bump, etc. Even if you can’t see anything, clean everything. 5) Pump up the inner tube slightly, then reassemble it inside the tire. Reattach this to your rim without any hooks, if possible, and make sure your tire is in the right direction. Make sure the tube is not being squished by the rim. Be careful around the valve because that area can easily be damaged, so I usually tried to push the final bit of tire in the rim away from the valve. 6) Slowly re-inflate the tire, making sure nothing got caught. Pump up until you get to your max pressure. Make sure you have your pump on with a straight valve. Once that breaks, you need a new tube, too (a lesson from my first lat tire change). 7) Reattach your tire to your bike, making sure it is properly positioned without any friction from the breaks. Re-hook your breaks. And now, about the recipe: Chocolate Brownie Power Bars. This has been my favourite energy bar for biking so far. 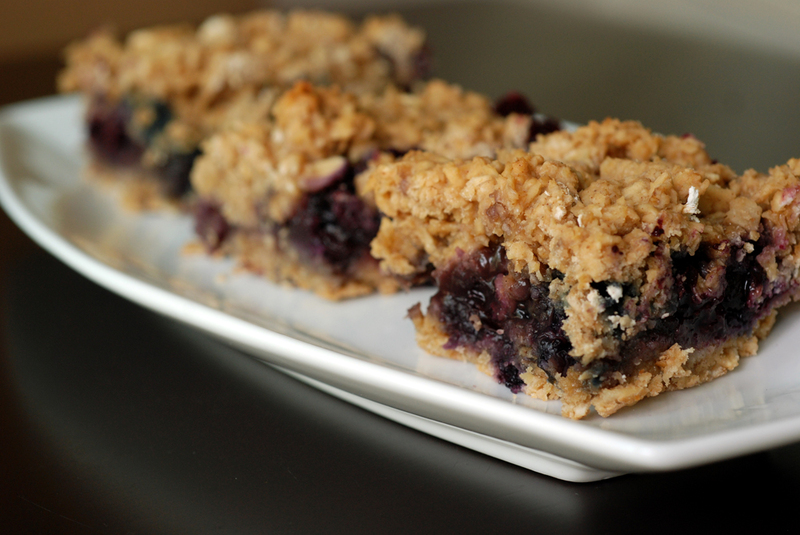 I prefer moist, not so sweet bars that travel well. 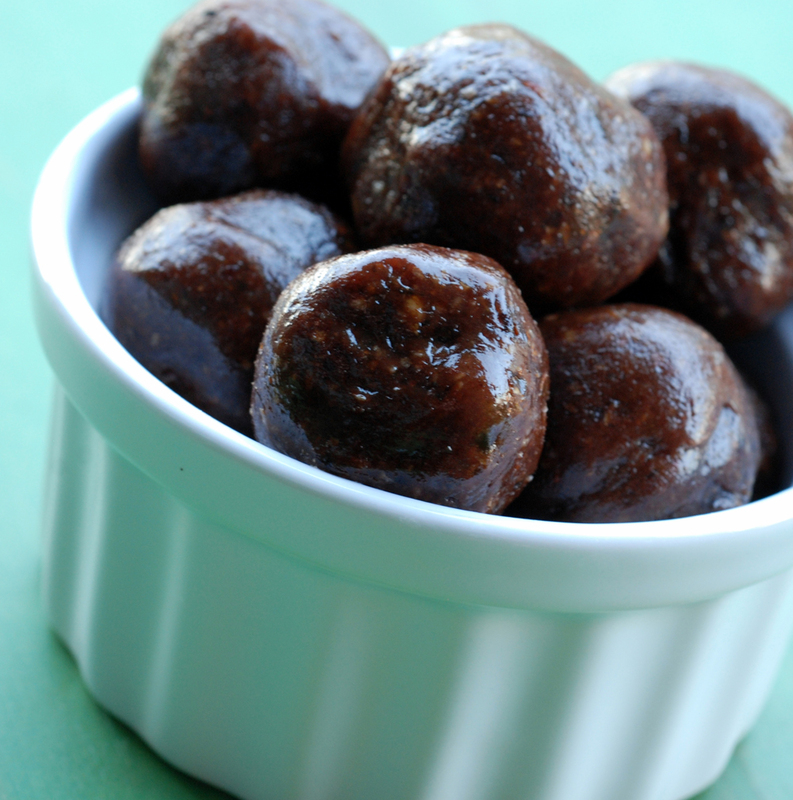 I really liked the cocoa mint nibbles, but they tasted like dates after they had been warmed in the sun. They were much better straight from the fridge for their fudge-y texture. 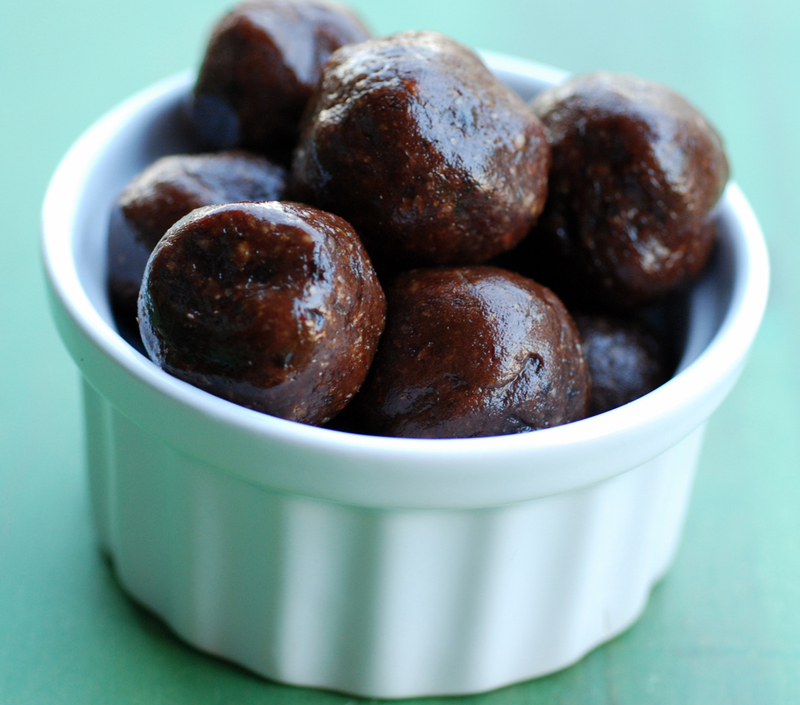 Adapted from Enlightened Cooking, these are similar to the cocoa nibbles but had more substance to them. They tasted more like a brownie and stayed that way after travelling with me all day. They also had a creamy taste which I think came from the milk powder. I originally threw it in because I had leftovers without a purpose (I originally bought some from the bulk store to make Momofuku’s Crack Pie). Now I think I have a super purpose for it, though, and will have to get myself some more. This is my submission to this week’s Weekend Herb Blogging hosted by me and to Slightly Indulgent Tuesdays. 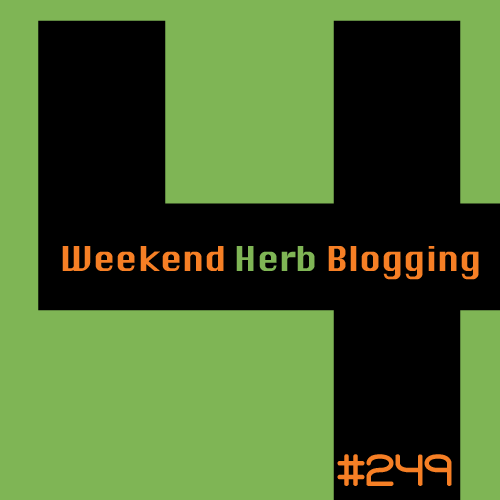 It is my pleasure to announce I am hosting Weekend Herb Blogging this week. It wasn’t that long ago that I hosted WHB #231, and I was thrilled when Haalo asked me for an encore presentation. Weekend Herb Blogging, now hosted by Haalo, is all about sharing information and recipes about any herb, fruit, vegetable, nut, grain, seed, flower or plant. For complete rules, check them out here. If you would like to join this culinary feast this week, please email me your name, name of dish, post url, location and photo until Sunday at saveur11 AT yahoo DOT ca, by September 5 at 5pm EST. Some fruit just don’t last long once ripe. OK, perhaps many of them. Peaches especially, though. You might buy them a bit on the firm side, and within 2 days on your counter, your basket of peaches are bursting with flavour. In another half a day, they may be overripe and start to go bad. So what’s a girl got to do with ripe peaches? Bake with them! Last year, I made one of my favourite cakes, a few times actually – especially when underbaked just slightly – Stone Fruit Tea Cake, with its heavy vanilla presence. I didn’t have enough peaches to bake that cake, as I have been pretty good about restraining myself from buying 3L baskets of peaches. 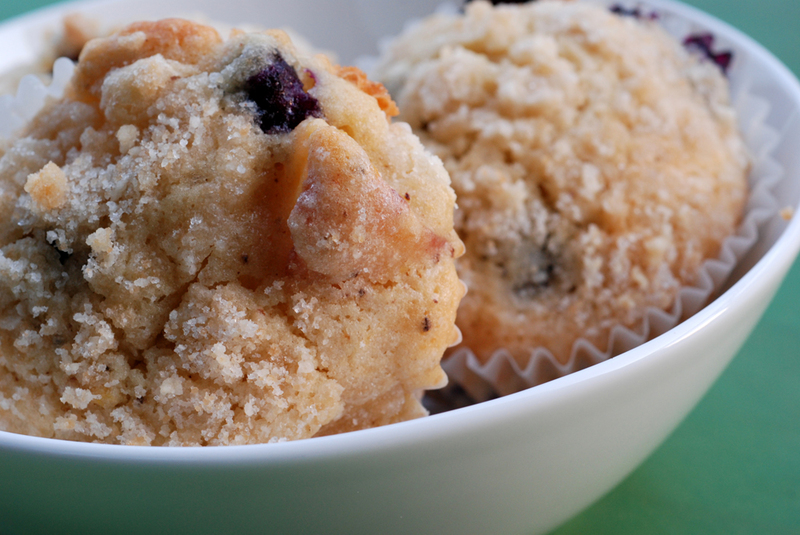 However, I had 2 peaches and some blueberries to throw together these lovely muffins. 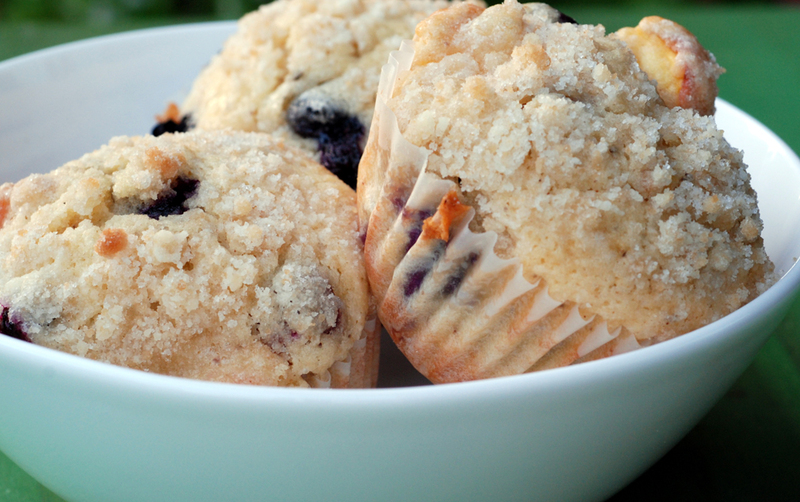 I was intrigued by these muffins when I originally spotted them on Very Culinary, who found them originally at Joy the Baker. She used raspberries and blueberries but I knew I wanted to use up some peaches. Peaches and blueberries are a wonderful combination, which I learned after making peach and blueberry salsa earlier this month. But what’s with this browned butter? I’ve never used it before but it sounded divine. Butter makes everything taste better and this seemed like a way to incorporate even more flavour into the batter. 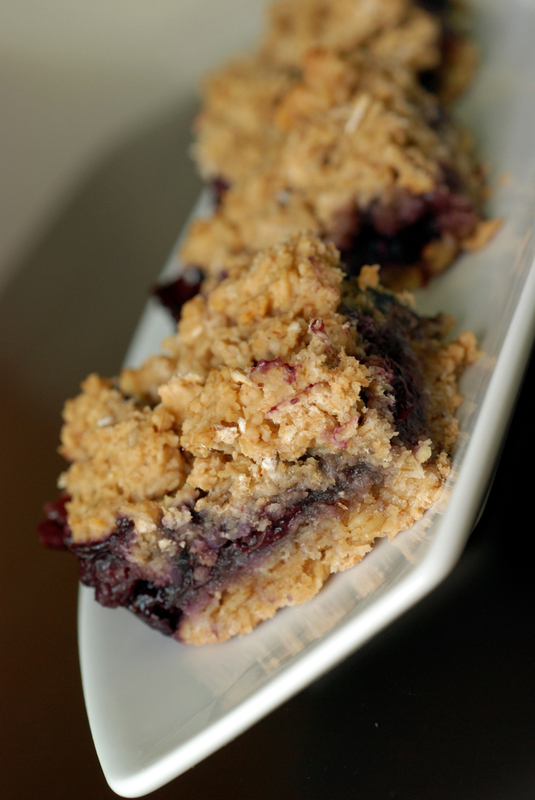 With a vanilla crumb topping that I had extra from Cranberry Buckle with Vanilla Crumb, these looked to be a very texture-tickling and flavourful dessert. This is my submission to this month’s Sugar High Friday featuring brown butter and to this month’s Breakfast Club for baking. This is my third dish in a string of salads with pomegranate molasses. No bulgur here, so my brain didn’t do the auto-compare with The Best Salad Ever. 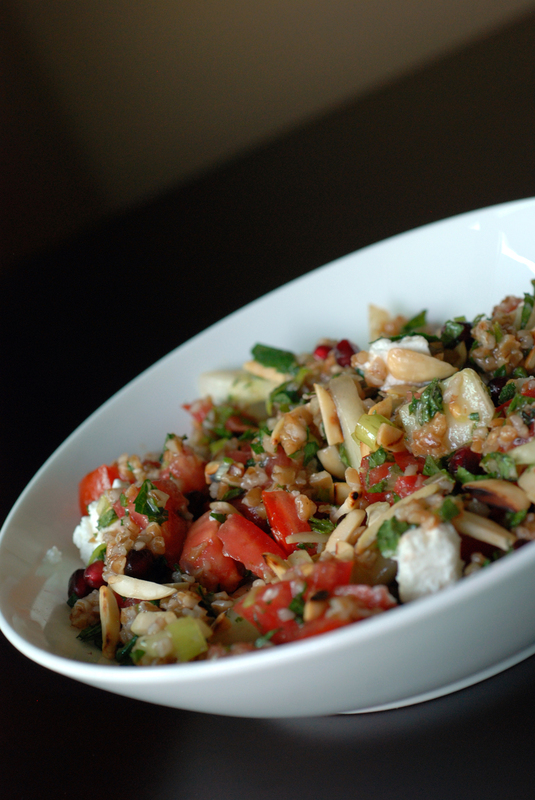 Just like the Pomegranate Tabbouleh Salad, this one was adapted from Closet Cooking when Kevin went on his pomegranate kick! 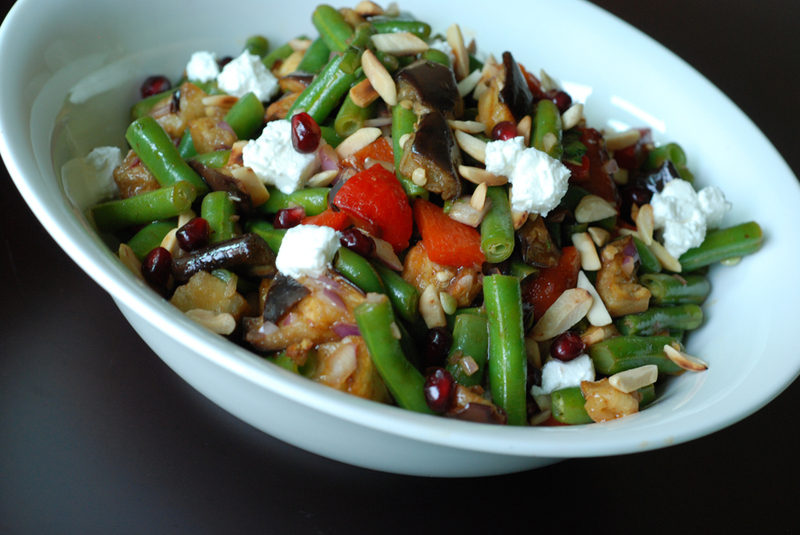 This is a salad filled with green beans, roasted eggplant and roasted red peppers. I liked the Spanish paprika, cinnamon and cumin with the roasted eggplant, so there was a savoury twist I wasn’t expecting. I may remove the cumin next time, though. The green beans added a nice crunch, and a lovely colour to boot. I also enjoyed the creaminess from the feta, but it is completely optional. The mild pomegranate dressing worked well to not overshadow the savoury flavours in the salad. I preferred this salad to the tabbouleh, despite it being less of a complete meal. 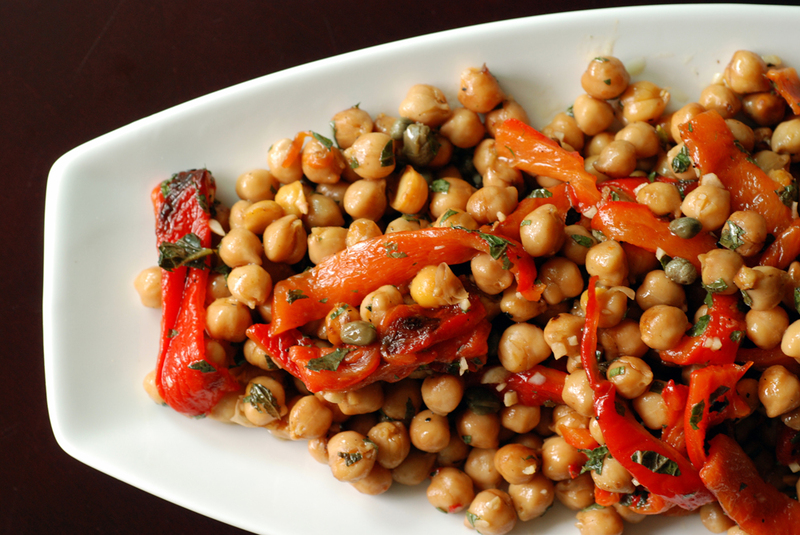 Serve it with some crusty bread or wrap it in a pita as a portable lunch. This is my submission to Ricki and Kim’s vegan SOS challenge featuring mint, to Jayasri for this month’s Cooking with Seeds featuring pomegranate seeds and to Deb for this week’s Souper Sundays. It is hard to compete with perfection. I made a delightful bulgur salad with pomegranate, almonds, oven charred tomatoes and chickpeas earlier this month and was looking to expand my horizons with a new twist on the bulgur and pomegranate flavours. 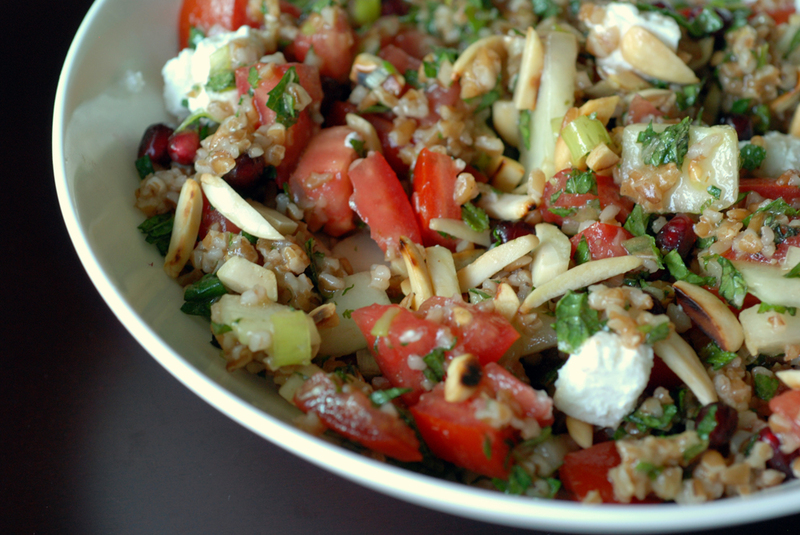 When I spotted a pomegranate tabbouleh salad at Closet Cooking, I knew what I wanted to try next. It seemed perfect for the summer with fresh crisp cucumber, fresh local tomatoes, soft feta and keeping my salad staples like toasted almonds. The pomegranate flavour came from the vinaigrette with pomegranate molasses and pomegranate seeds. And while it seemed like a reasonable salad, it just didn’t compare. I was left thinking, This is ok, but not the best salad ever. The best salad ever will forever torment me as its counterparts will fall short. My memory will probably hype up the salad even further in its absence – oh my! As a main course salad, I like a lot of substance within the salad. More stuff than bulgur or leaves. Both salads had that, but the winning salad also had more sustenance with chickpeas. Both vinaigrettes had pomegranate molasses, but the winning salad had a more pronounced tartness from the pomegranate molasses since I mistakenly read the recipe without diluting the molasses. So perhaps the mind-blowing pomegranate flavour was missing. The winning salad also had Aleppo chili flakes which brings anything from ordinary to extraordinary, and this tabbouleh had none. Not that I think tabbouleh warrants chili flakes, but the mantra of balancing sweet, sour, spicy and bitter is making more and more sense. It has been a winning combo for my recent dishes, including the winning salad. To be fair to the tabbouleh, it was enjoyed by others. But they had not yet tasted the winning salad ever. 😉 For me, there were too many similarities between the salads for me not to do the comparison and feel like it came out short. 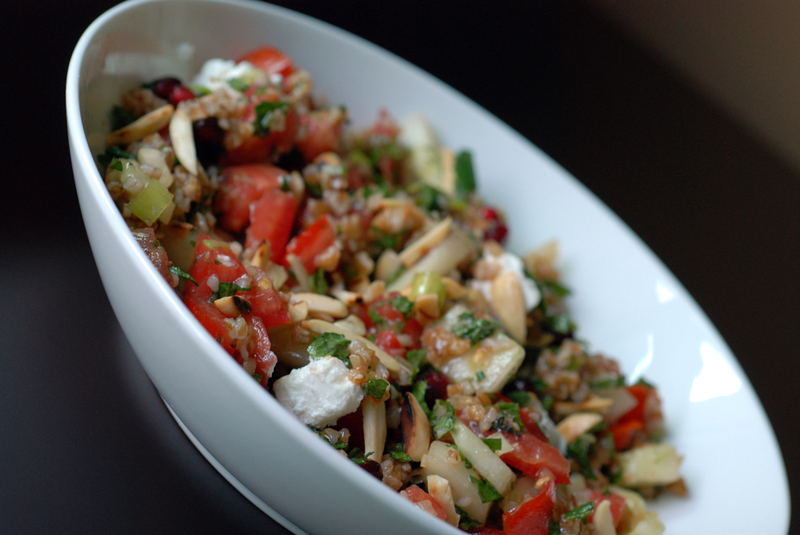 Perhaps I will have to modify the tabbouleh with these changes in mind when I score another deal on pomegranates. This is my submission to Ricki and Kim’s vegan SOS challenge featuring mint, to PJ for this month’s Healing Foods featuring tomatoes, to Jayasri for this month’s Cooking with Seeds featuring pomegranate seeds and to Deb for this week’s Souper Sundays. Saveur’s note: I am delighted to have a guest post from Rob at Free Pants Online. He usually posts about his travel adventures although he has posted some recipes. He made the most delicious tempeh sandwiches recently and I really wanted to share the recipe. 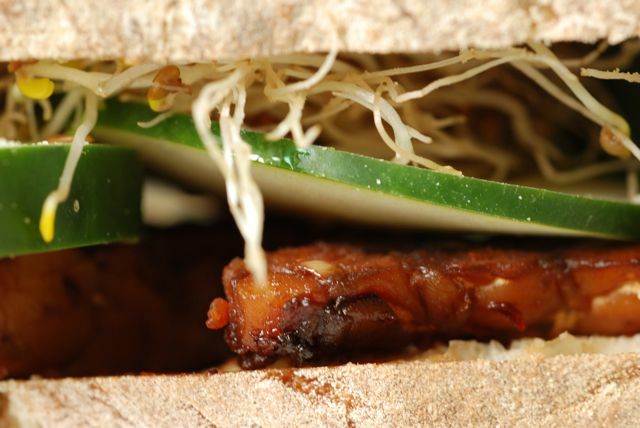 I love to share healthy, great tasting food – and these sandwiches were phenomenal. However, since I didn’t technically make it myself (although I was in the same room), I begged Rob to write a post about it to spread some tempeh love. A couple of weeks ago, I visited one of the health food shops in Kensington Market. I had a craving for tempeh. I hadn’t had it in a while. None of the shops in my neighbourhood (Yonge and Eglinton) seem to carry it. As such, I picked up a couple packages and brought them home. I have randomly tried to prepare tempeh while traveling. I didn’t really know what I was doing and usually just fried it to enjoy its simple flavour: denser and meatier than tofu; maybe a little nuttier. I know I could do better once I was armed with my own kitchen. What was I to do? I asked Saveur for recommendations. She confessed that she’s never tried tempeh before. Oh my! She’s a clever one, though, and was still able to make some suggestions for me. 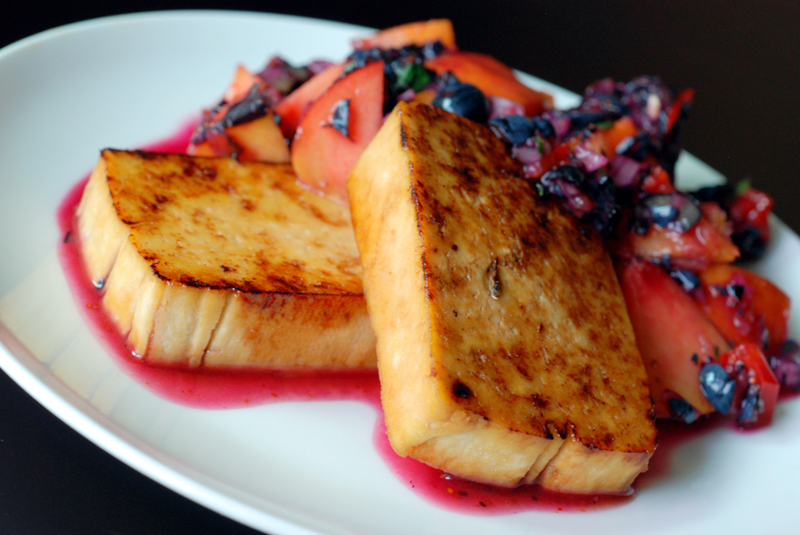 This recipe for Maple Grilled Tempeh looked very intriguing to me. Since I don’t have any maple syrup (what kind of weak Canadian am I, anyways?) or rice vinegar, or a proper grill to cook these on, I decided to adapt the recipe and created the marinade listed below. Oh wow! These were tasty! They were bursting with flavour! The first time I had these, I had some parathas and steamed broccoli on the side, which is very typical for me. I didn’t choose the broccoli for its complementary qualities to my tempeh; but simply since I usually have some in the fridge and it’s my favourite vegetable anyways. Parathas are just delicious… period. I might have chosen rice as my starchy side, but I my rice cooker is currently out on loan. 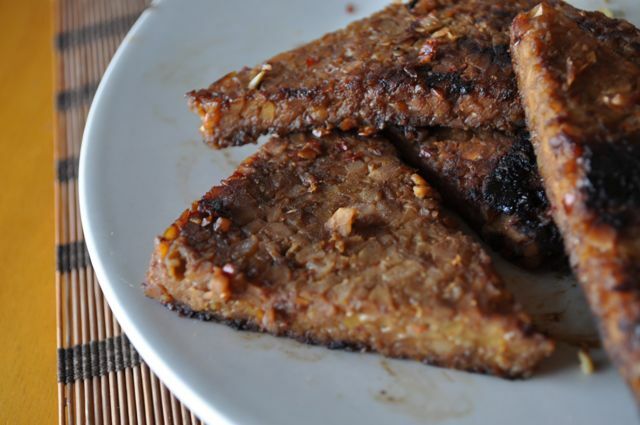 These marinated and fried tempeh pieces were great when they were fresh. As leftovers, however, there was much to be desired. They had dried out and weren’t nearly so flavourful. Eat these fresh, or don’t eat them at all! The following weekend, I planned on going to Olympic Island with Saveur and her friend to see Arcade Fire play a show. The concert was really great! This blog isn’t a music blog, though. It’s a food blog. You’re certainly not interested in any concerts. I’ve read somewhere that tempeh is great as a meat substitute in sandwiches. Now that was my master plan! We preceded the show with a picnic. The picnic was really great, too! 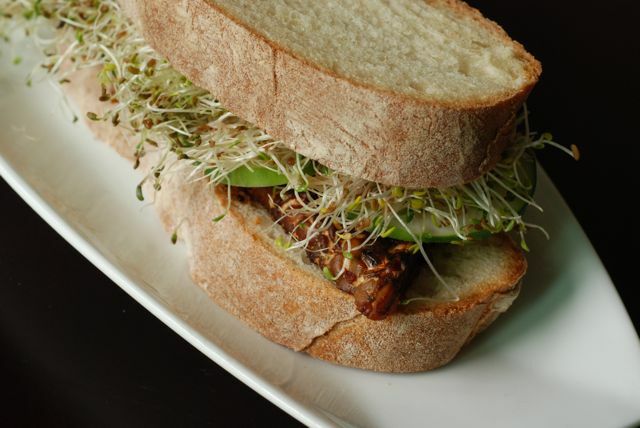 I decided to take on the task of bringing sandwiches by combining the same marinated tempeh with alfalfa sprouts and cucumber on ciabatta bread. In my head, it sounded like a match made in heaven. It worked out just fine! This recipe is not one that I found anywhere. I just thought it would work…. it looks like it did! Oh. What does “CAT” stand for? Cucumber, Alfalfa, and Tempeh, of course! What did you think it could be? On Rob’s behalf, I am sending this to Deb for this week’s Souper Sundays (which also includes sandwiches). I almost didn’t take photos of this dish. But not because the bars weren’t photogenic. They just didn’t have the substance to back up their looks. Then I wrapped one up and brought it with me on my long bicycle rides. And this is where the bar shined. It travelled well, in spite of the gooey centre, and its lack of sweetness was perfect. I am figuring out what I like to eat pre-, post- and during exercise, and I am definitely shunning sweet, dry and heavy dishes. These bars were perfect specifically because they were not that sweet, they were very moist and they were filled with carbs (only 1g of fat per serving). This is my submission to this month’s Tea Time Treats and this week’s Weekend Herb Blogging hosted by Astrid from Paulchen’s Foodblog. 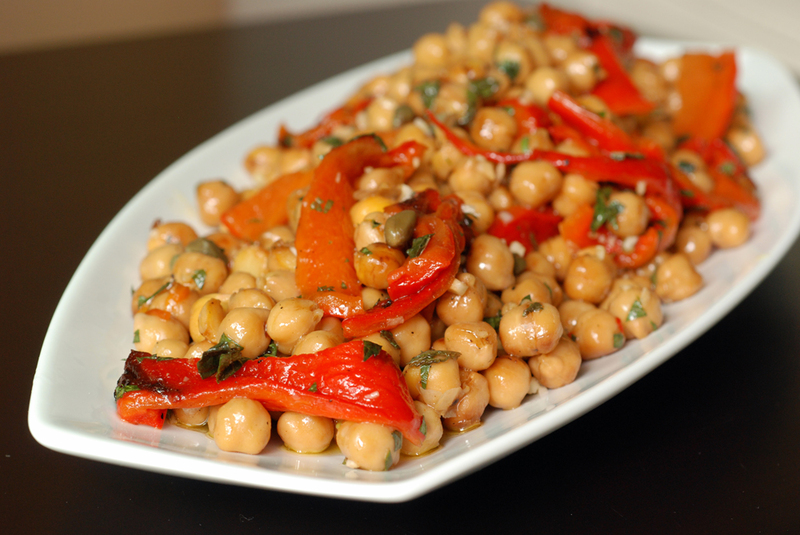 I have been on such a chickpea kick, adding them to my recent salads, that I am starting to wonder whether I should try to make them from dry. I am all for dry beans, as they are infinitely cheaper and probably taste better, too. Lentils are a no brainer as they cook up quickly and don’t need an overnight soak. That overnight soak, ie. advance preparation, is usually not that onerous since I routinely plan my meals days in advance. However, I have not had good luck with cooking dry chickpeas nor black beans, incidentally my two favourite beans – they just don’t seem to work. I remember having a pool of black soup with hard beans when I cooked black beans the first time. Does anyone have suggestions? Other than buy beans from a high-turnover bean store? (Bestwin definitely fits the bill here). 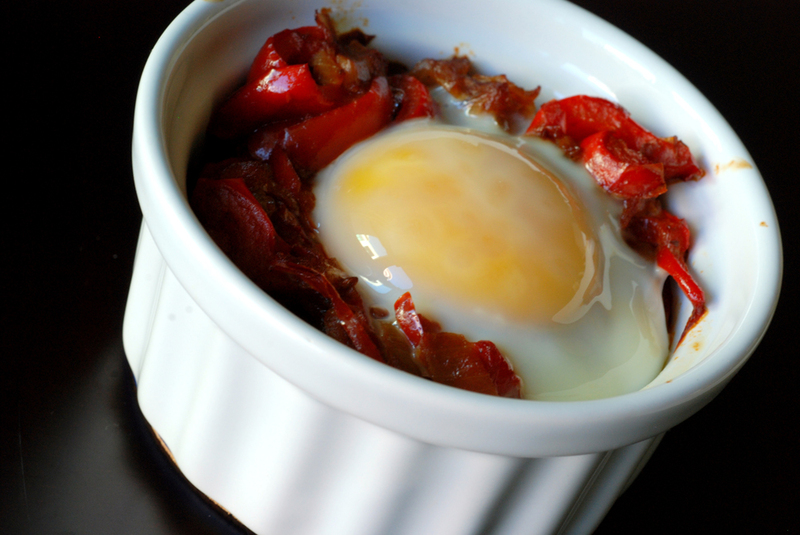 I highly recommend roasting your own red peppers, though. I know you can buy them in a can, but freshly roasted peppers are infinitely juicier, tastier and healthier since they aren’t packed in oil. When you have a simple salad, such as this one, each ingredient counts. 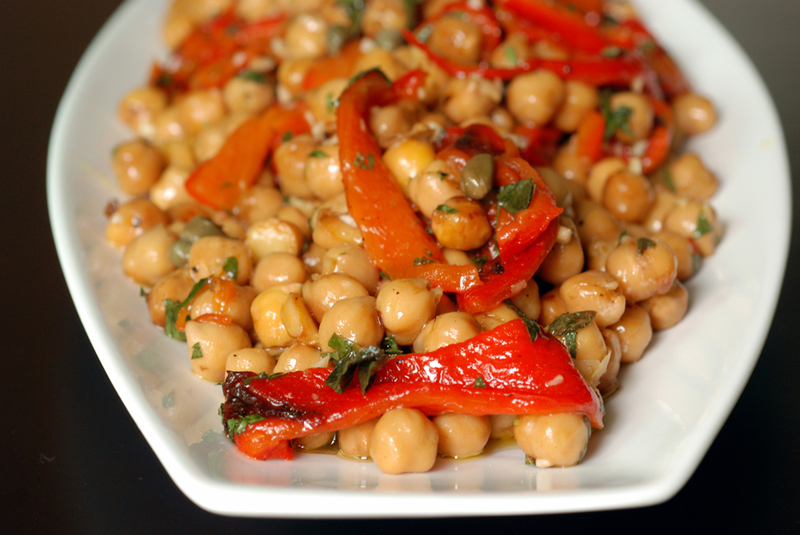 And this salad is delicious: the sweet roasted red peppers are paired with the creamy, nutty pan-fried chickpeas, and they are dressed with a minty red wine vinegar vinaigrette with a sour note from capers. 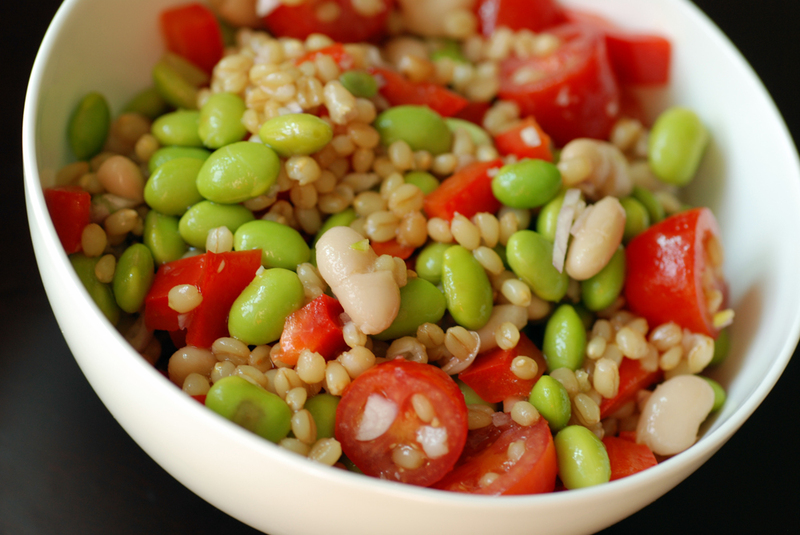 Lovely for picnics as a side salad, or even a main meal as the beans are quite filling. 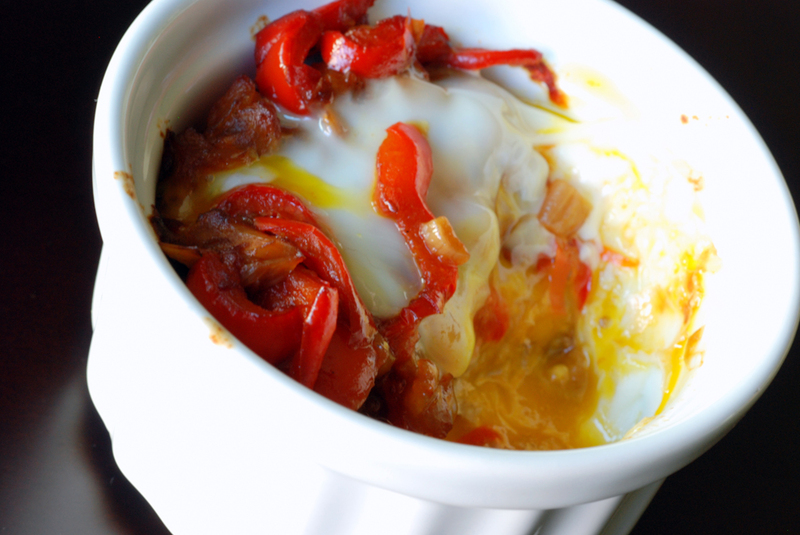 Traditionally this is served as a tapa, or appetizer, in Spanish cuisine. I originally found the recipe on Smitten Kitchen, who adapted it from Deborah Madison’s Vegetarian Cooking for Everyone. I found that there was a fair bit of oily dressing left over, so I modified the recipe to increase the red peppers and chickpeas. I also pan-fried the chickpeas in some of the oil, since pan-fried chickpeas taste a lot better than chickpeas straight from a can (the lesson I learned while making the utterly delicious warm chickpea and artichoke salad). This is my submission to Ricki and Kim’s vegan SOS challenge featuring mint, to Nithu for this month’s Cooking with Whole Foods featuring chickpeas, to this week’s Wellness Weekend,to this week’s Healthy Vegan Fridays, this month’s My Legume Love Affair, hosted by Simona at Briciole, and to Deb for this week’s Souper Sundays (which also includes salads). In a few months, I will be going to Morocco. I have never had this much time to plan a trip. My previous trips to Japan and Turkey afforded me barely a month to plan my itinerary and accommodations. This time, I booked this trip nearly 6 months in advance, when airfare was cheap to Casablanca. 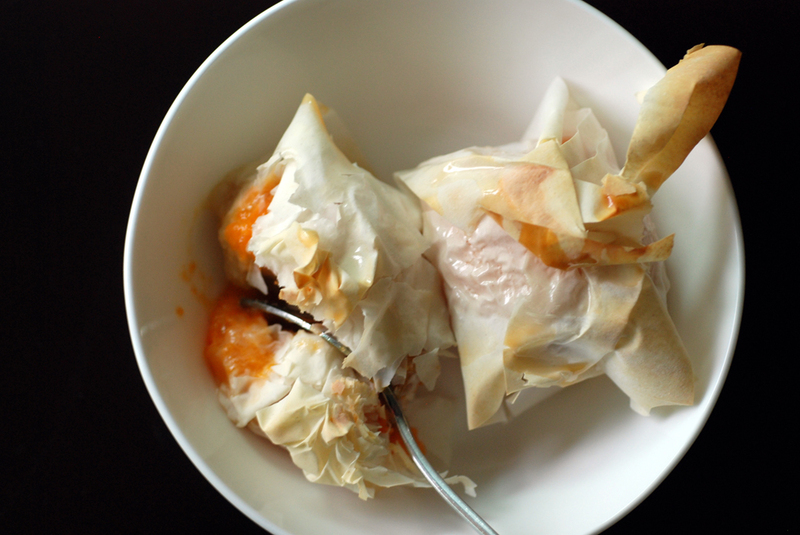 While browsing though Moroccan Food & Cooking by Ghillie Basan, I spotted these cute apricot parcels with a honey glaze. They were perfect because it is apricot season AND I had leftover scraps of phyllo dough after making baklava. 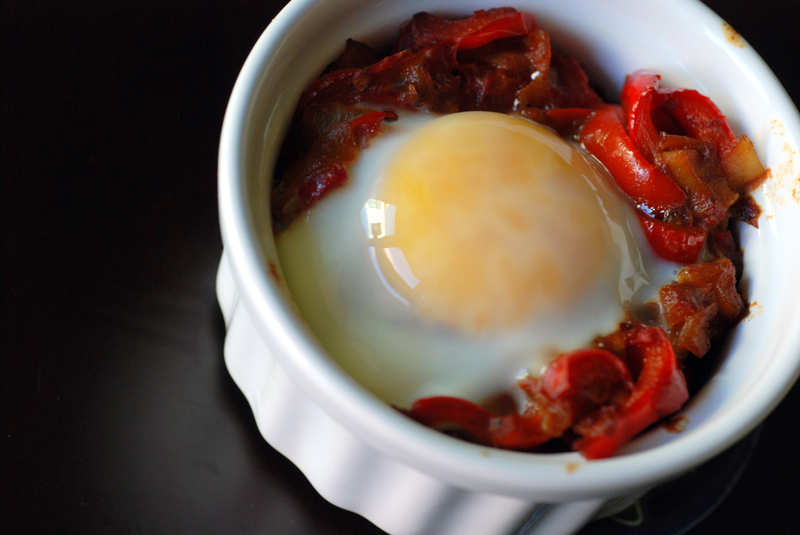 I loved this recipe because it was very easy to whip together. 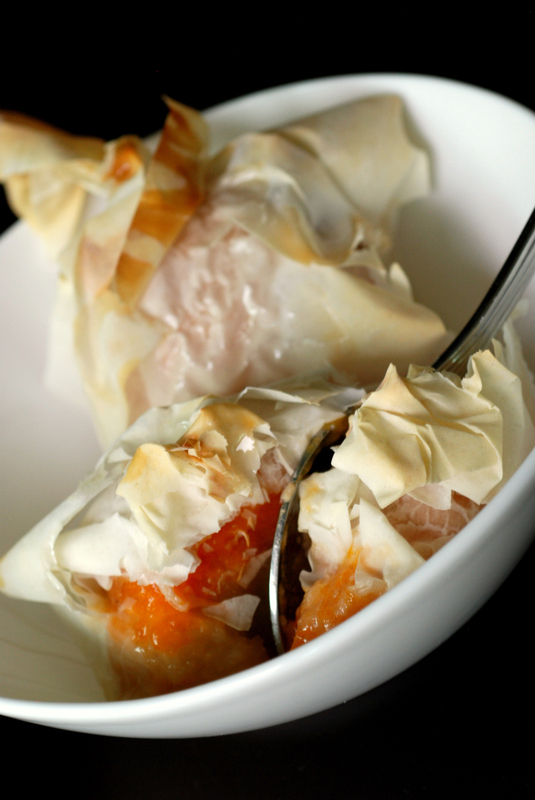 Apricots are slit in half and stuffed with an almond paste, akin to marzipan, and they are wrapped individually in a piece of phyllo dough. 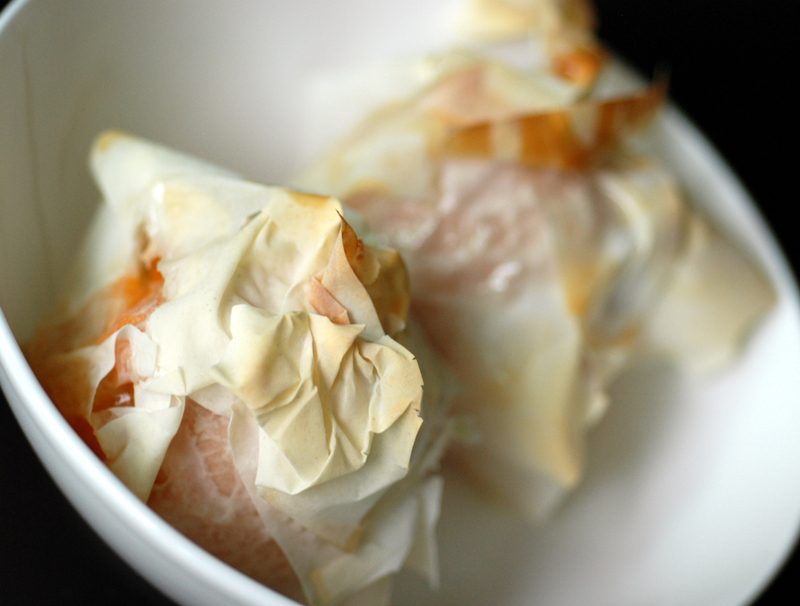 I had long scraps of phyllo dough, so I used 2 long pieces to wrap the apricot. No need for additional butter, just a drizzle of honey. 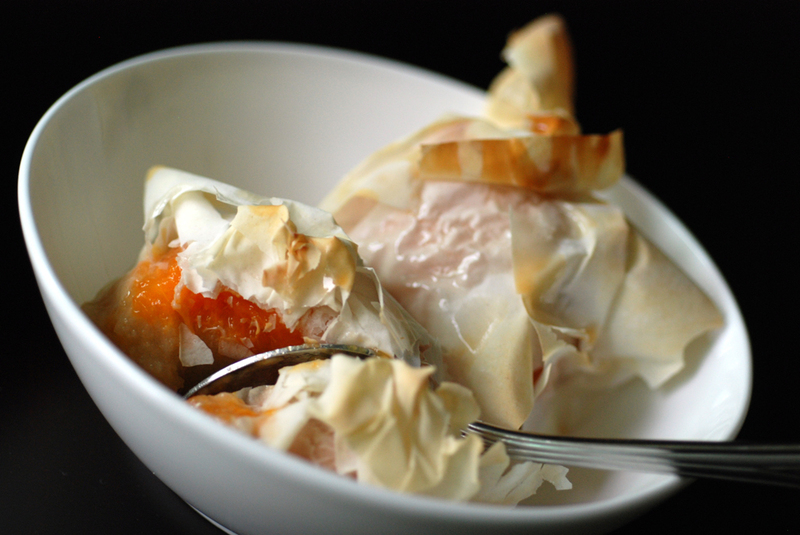 Bake them in the oven to find yourself with a silky, baked apricot with an almond centre and a crisp phyllo coat. Summer simplicity at its best. This can be served warm or cold, but I preferred these served warm. Leftovers needed to be perked up in the oven to recrisp the phyllo dough. This is my submission to this week’s Weekend Herb Blogging hosted by Marija from Palachinka, and to My Kitchen, My World, featuring Moroccan dishes this month. Sometimes I get distracted at a grocery store by sales. A pound of frozen edamame was $1 at T&T and I snapped it up, despite not knowing what to make with it. I luckily found space in my tiny condo-sized freezer until I spotted this delicious salad at Keep Your Diet Real, who spotted it from an ad in a magazine. This was a light yet hearty salad at the same time. 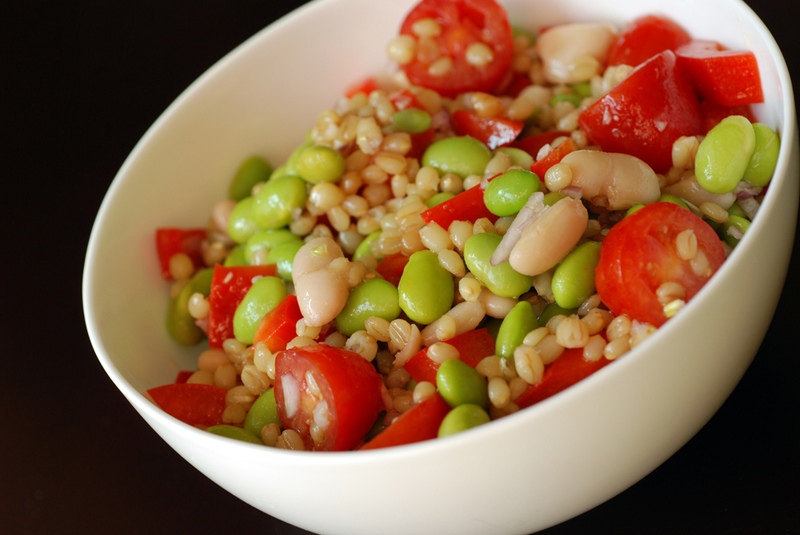 It was hearty with one of my favourite whole grains: wheat berries. 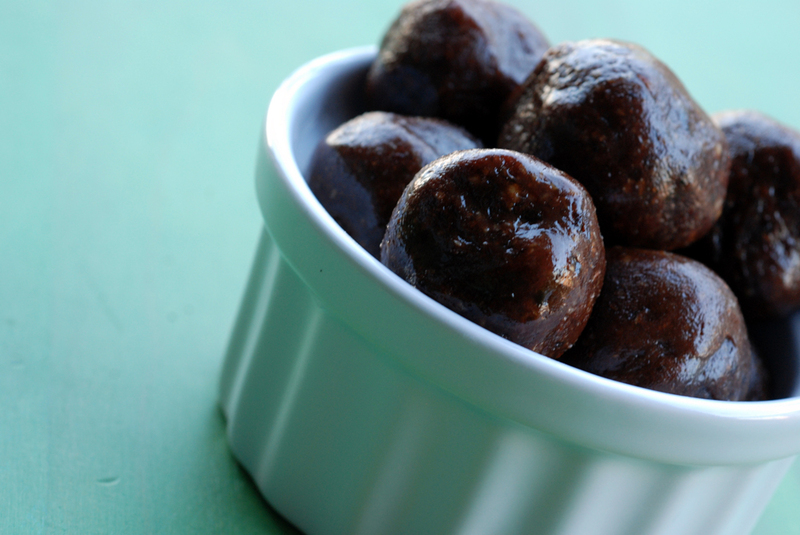 Nutty and chewy, they can really hold their own in a salad. 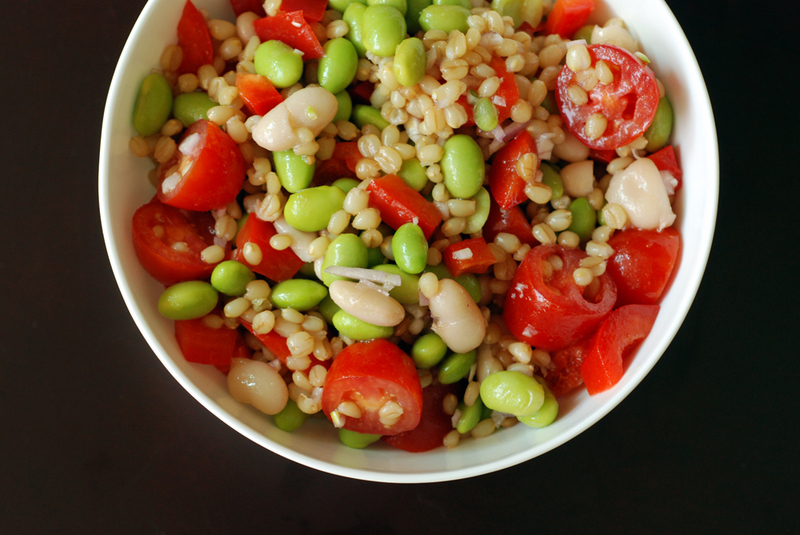 Sweet cherry tomatoes, creamy edamame beans and white beans are added for further textural and nutritional contrast. The dressing is a plain red wine vinegar vinaigrette and the red onions add the bit of kick needed for such a simple salad. This is my submission to Deb for this week’s Souper Sundays, this month’s My Legume Love Affair, hosted by Simona at Briciole, and to PJ for this month’s Healing Foods featuring tomatoes. I will not delve into the debate of where baklava originated because it is a common dessert across the Middle East. However, I will let you know that I play favourites: I like Turkish baklava the most. Before I visited Turkey, I did not like the oftentimes sickeningly sweet walnut and phyllo dough pastry drenched in honey. When I went to Turkey, though, I was hooked after our first bite the night we arrived. 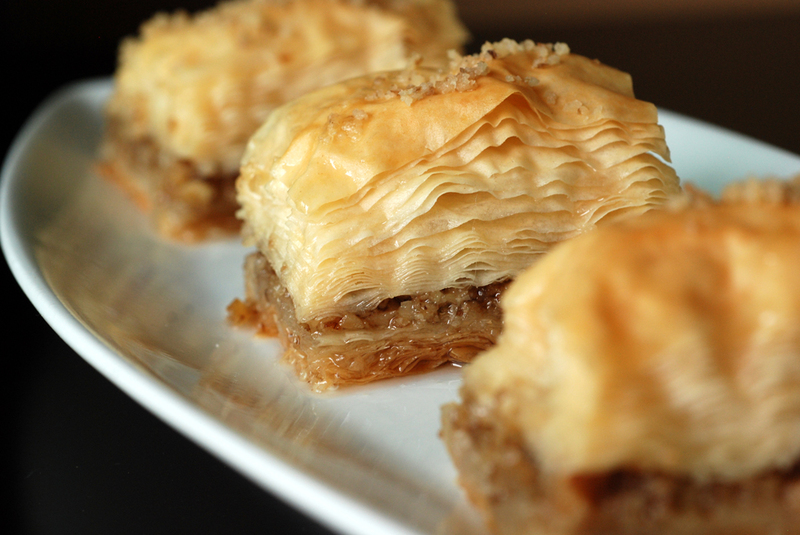 We sampled baklava at nearly every restaurant we encountered it on the dessert menu. I wanted to try a variety of Turkish desserts, but my dad only wanted baklava (I never would have discovered kunefe if I only stuck to baklava!). It was never tooth-aching sweet. It was nice and light, usually with a pistachio filling. There was a sweet syrup but it complemented the pastry as opposed to clashing and overpowering the dish. It wasn’t like anything I have had in Canada. One of the greatest things about baking yourself is that you can recreate these dishes at home. 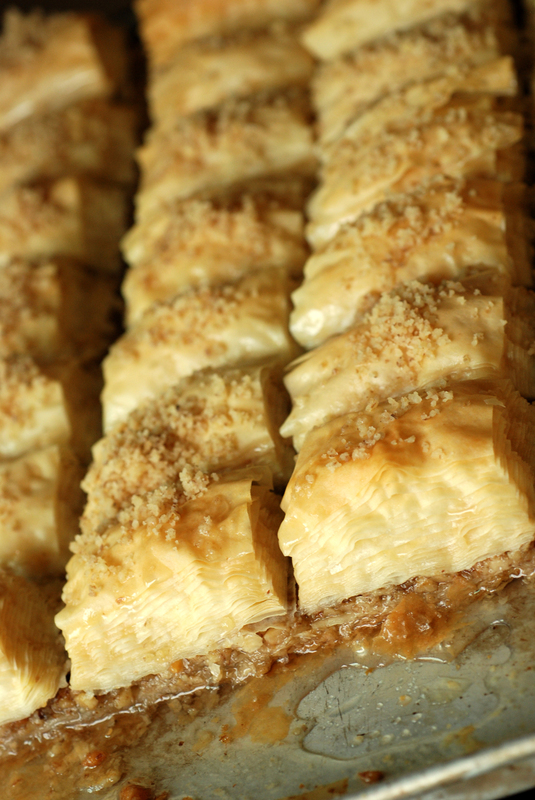 No longer are you a victim to honey baklava, which reigns in Greek and Persian stores. 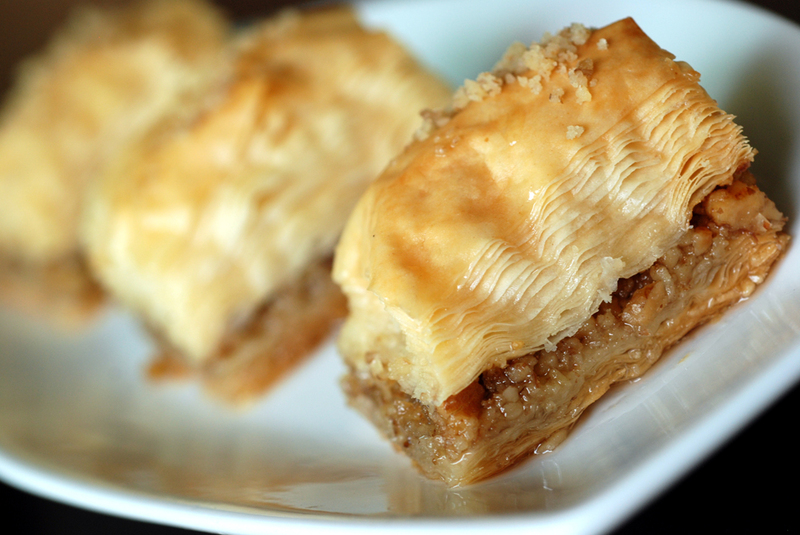 And while it may seem difficult, baklava is easy to make at home. It is time consuming, but very straightforward. 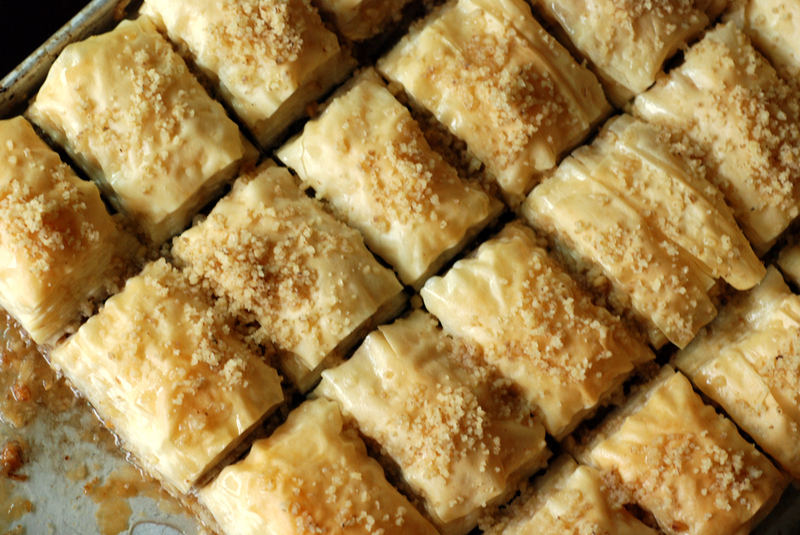 The bad news is that most recipes make a lot of baklava, so you will have to share this treat with family and friends. If they weren’t your friends before, they will be now! Is that such a bad thing after all? This is my submission to AWED-Turkey, hosted by me this month, and to this week’s BSI featuring butter. During the summer, grocery stores overflow with local ripe fruit and vegetables. It would be a shame not to catch some fresh Niagara peaches, fresh vine-ripened tomatoes, or cash in on cheap, overflowing zucchini during their seasonal peak. There is nothing better than fresh produce. Right now, peaches from Niagara are tricking into stores. They arrived earlier than previous years due to the hot weather, and I am embracing their early arrival. Sweet, juicy peaches are incredible but sadly don’t last very long. Last summer, I made a succulent peach tea cake, when I bought a few 3L containers of peaches. I have restrained myself so far, and only bought a handful of peaches. But I did buy a big clamshell of blueberries, so expect to see a few more blueberry dishes here. 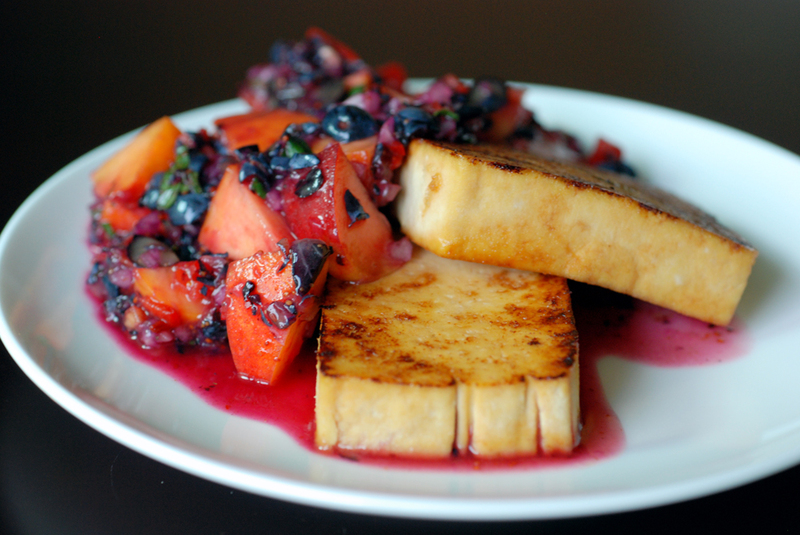 I spotted a lovely summer savoury dish on Fat Free Vegan, with maple-chili grilled tofu steaks with a blueberry-peach salsa. I adapted the recipe to suit my own tastes, substituting Aleppo chili flakes for the heat, increasing the peach to blueberry ratio, and swapping lime juice for the lemon juice (I am slowing going through the 18 limes I picked up for $1 at Bestwin). I also don’t like parsley so I used mint instead, which was a great choice. This is a wonderful way to play with the flavours of the summer. Enjoy! This is my submission to Ricki and Kim’s vegan SOS challenge featuring mint, to Ricki’s Wellness Weekend, and to this month’s My Legume Love Affair, hosted by Simona at Briciole. Living in a city as nice as Toronto, I am surrounded by many great restaurants. I try to cook at home most of the time, for health and economic reasons, but I am slowly scoping out delicious, cheap places to meet over food prepared by someone else. Guu – still Toronto’s newest sweetheart, with a second location expected in the Annexe, this is a popular Japanese izakaya (aka tapa-style bar). Everyone is welcomed as soon as they enter and leave the resto and the dishes have yet to disappoint me. All dishes are under $10, but the sizes are smaller and meant for sharing. 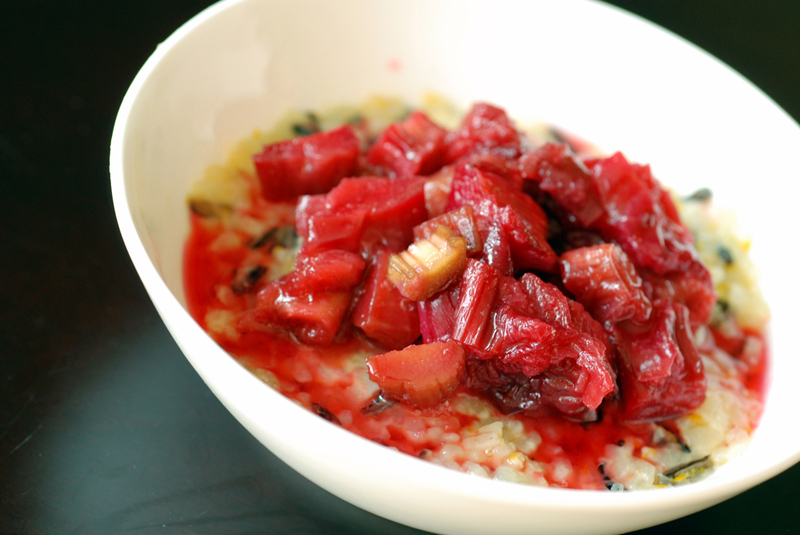 Pomegranate – a newer find that complements my latest love of Middle Eastern food. This is Persian food at its finest, at reasonable prices around $15. Amaya – A bit of a splurge restaurant (mains under $20), especially since it is Indian, but I am enthralled by their butter chicken. If only I knew how to make it myself! Canoe – This is arguably Toronto’s best restaurant and it has the price-point such that it is very elitist, and limited to special occasions only. You get what you pay for, and it is lip-smacking delicious. I really appreciate their use of local, unique ingredients, prepared, oftentimes, in a myriad of ways. I know these are dishes I would have a difficult time recreating at home, which is important for my restaurant adventures. While the written menu did not immediately appeal to me, I just had to ask the server to explain what each dish entailed. It is here that I had a surreal mushroom soup that tasted like apple due to the varieties used, and I had squab prepared in 3 different ways: marinated with Newfoundland screech, drenched in a Saskatoon berry sauce and served with a side of dinosaur kale. 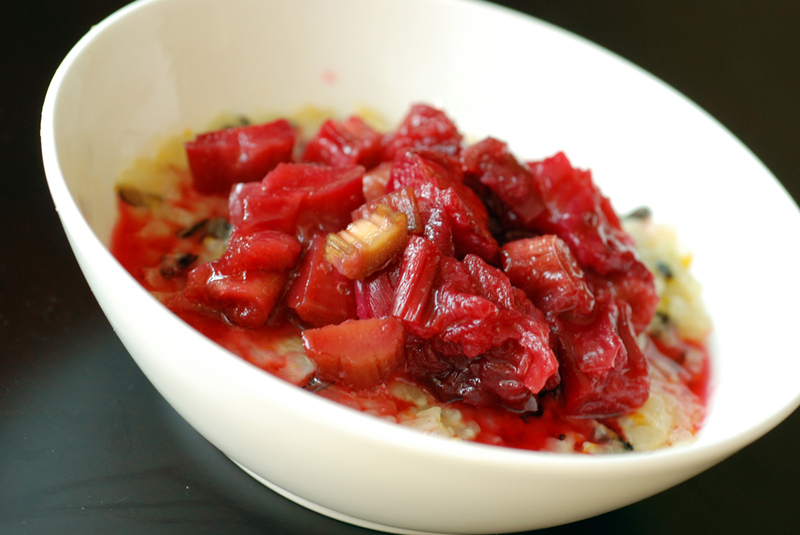 It boasted a baked rice pudding with short-grain and wild rice within a orange- and cinnamon-scented creamy base, topped with a sweet-and-tart rhubarb compote. This is my submission to My Kitchen, My World, featuring food from Canada, and Ivonne at Cream Puffs in Venice for Magazine Mondays.